The Morrison Fig. 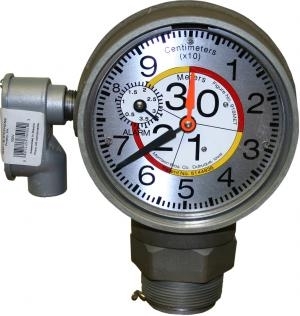 918 Clock Gauge is used for measuring liquid level in aboveground storage tanks. It utilizes the Fig. 818 Clock Gauge with a built-in high level warning alarm. It contains a battery powered, intrinsically safe, alarm unit that is mounted remote from the gauge. Alarm is set for desired level during installation and can be re-set at any time for a change in alarm level requirements. The alarm features a 90 decibel high pitched �Beep� cycle alarm, a test/cancel switch, and is powered by two 9 volt batteries (included). Readout format is on a standard 12 hour clock face. Small hand represents feet and the large hand inches. Gauge can be read up to 20-30 ft. away to within 1/8� (1.97� in Metric Version). Maximum measurement capability is 12 feet (3.66 Meters).The gauge can be rotated 3600 after mounting.